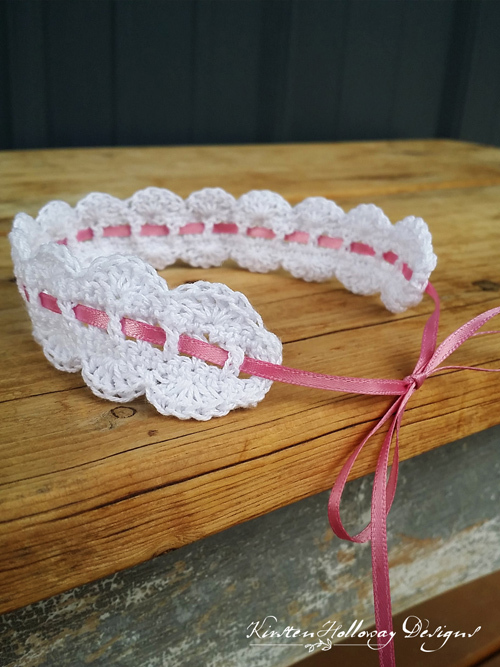 This dainty, scalloped lace headband is easy to work up, and perfect for those who are just starting to experiment with crochet thread. 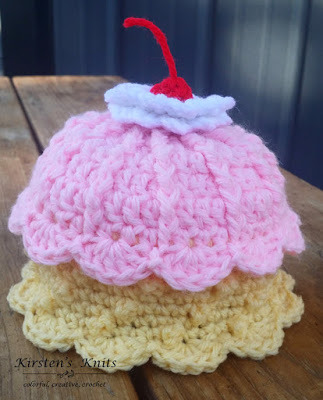 It can be made in a couple of hours or less, and would be a nice last-minute baby shower gift. Ribbon of any color can be used, and changed out with the seasons. Finished headband should measure about 11.5″ to 12″ long. -One of of my testers ended up with a band that was 12.5″. I tend to crochet a bit tighter with thread than I do with yarn! If you crochet loosely, use the smaller 2.25mm steel hook. Row 7: ch 1, sc in next 2 stitches. Skip 2, 5 dc into into next stitch, skip 2 stitches, sc into next stitch. *skip next 2 stitches, 5 dc into next stitch, skip 2 stitches, sc in next stitch* Repeat until you have 13 shells. Sc in last stitch. Join to end with a sl st. 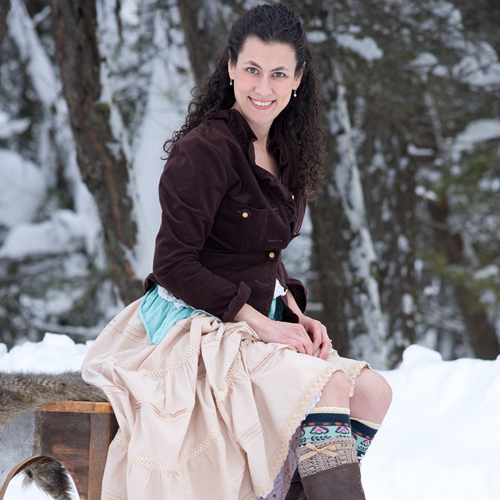 Using 26″ length of ribbon, weave through spaces with a ribbon or yarn needle. For durability, use fray check or a tiny amount of clear nail polish to seal the very ends of the ribbon. The scalloped lace headband pattern was made to be used by individuals, and small business crocheters alike. Selling your finished pieces in boutiques, at farmer’s markets, craft shows and other events is encouraged! The only thing I require is that it not be used commercially to produce millions of copies.I love seeing finished projects you have made from this pattern! Good luck as you perfect this new skill! Thank you! There is only the written pattern. It’s very simple and basic though so I’m sure if you take it one piece at a time you’ll get it!